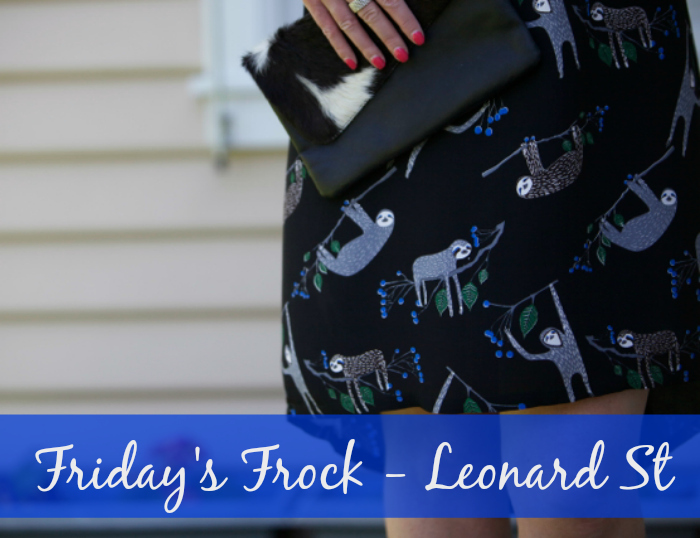 Happy Friyay and a big welcome to the second instalment of Friday’s Frock. As I mentioned last week, I’m participating in Frocktober this year to raise funds and awareness for the Ovarian Cancer Research Foundation (OCRF) by wearing a fabulous frock every Friday from some of my favourite smaller, boutique and/or local designers. Today, I’m super thrilled to bring you two show stoppers from the independent Melbourne label Leonard St. 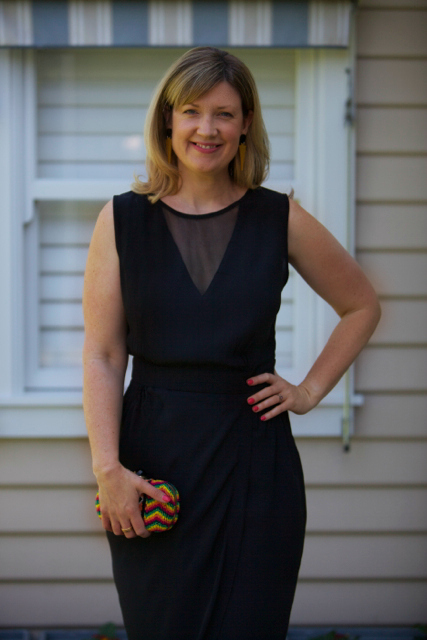 If the name rings a bell, some of you might recall that I wore two fab Leonard St frocks at #pbevent in August. 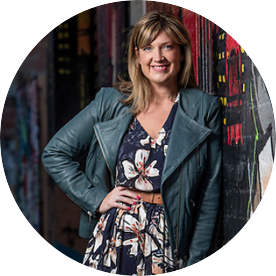 “Leonard St. designer and founder Amanda McCarthy loves print, colour and beautiful fabrics. All designs and fabrics are made to endure years of love and wear. Leonard St was born in 2004 with doodles and experiments, inspired by the aesthetic of London style and named after a dynamic street in east London. At Leonard St, you’ll find fun, unique prints, flattering cuts and interesting details, as you can see in the dresses below. From a price point perspective, you are looking at Gorman-esque pricing, which reflects the fact that this is a small, independent designer label. Let’s start with The Planner dress. Below, the model has dressed it down by wearing it oversized with trainers. If you have a few curves however, this dress can easily move into siren territory. This beautiful, flattering dress is made from a viscose rayon woven blend with a crepe handle and has a striking chiffon V detail at the neckline. It feels dressy enough to wear to a cocktail party or an event without trying too hard. I think it manages to do this because the design is contemporary while the black is classic and chic. 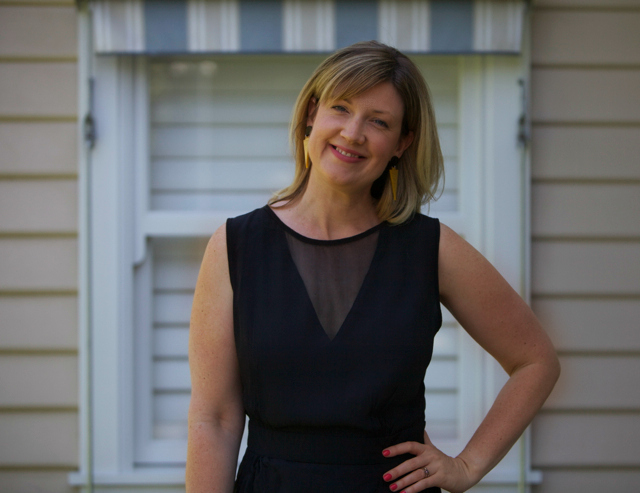 I also love that this dress shows a bit of skin without the usual accompanying bra dilemmas – you can simply add your favourite black bra and heels and you have a completely fabulous outfit. Above, I’ve paired it with these fabulous Golden Eye statement earrings ($24.95) from Brisbane designer Materiel,* a Mimco clutch and a pair of suede cut out heels from Marcs, both from last summer. Can I tell you what a pleasure it is to wear this dress? It somehow manages to be loose, flattering and dressy all at once. That’s not an easy trifecta. I love that the top half of this dress blouses out a bit (catering more than adequately for me) but draws in again flatteringly at the waist. I like a bit of room on top, especially in hot weather, and the design of this dress achieves this without creating bulk. The waistband creates some shape while the long tulip skirt drapes beautifully, creating shape and interest. The flash of leg shows a bit of skin to break up the bottom half of the dress and the mid calf length is bang on trend. It’s easy to care for too and requires a gentle hand wash. Size wise, I’m wearing a size 12 which is roomy but comfortably firm on the waistband. It’s available in sizes 8 – 14. This dress also comes in a stunning deep sea green. Now let’s move on to the Zeusophobia dress. 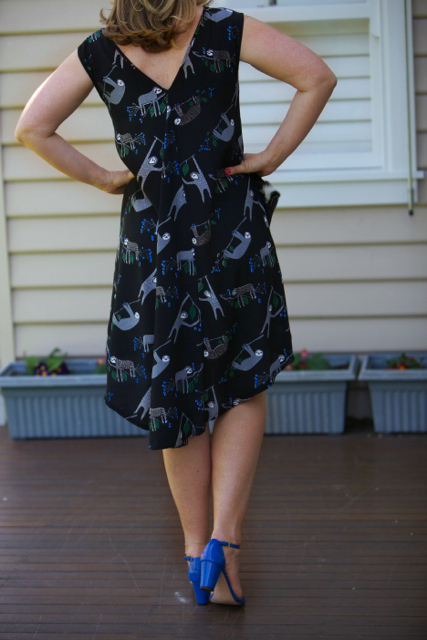 Zeusophobia dress in Black Sloth, $230* (by the way I bought these Leather Knot Sandals in tan – I’m wearing them here – and they are super comfortable, look fab and true to size). I absolutely love the style of this Zeusophobia dress – the high low hemline and the deep V at the back with the tail feature hemlime make this dress a lot more interesting than a lot of offerings. If it this style looks familiar, you might recall I wore the 3/4 sleeve version in another print here. 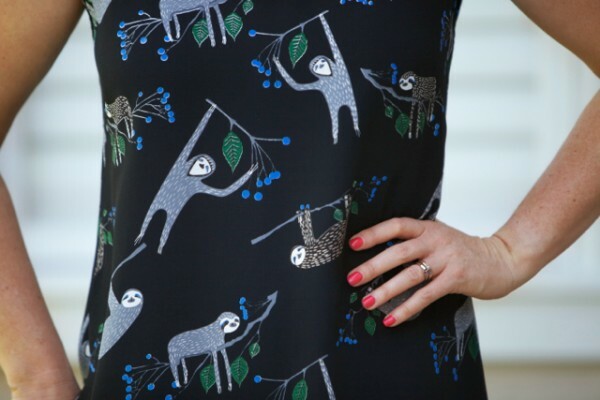 This sloth print is fun and a bit quirky which I think makes the dress more versatile and able to be dressed up or down. I’ve kept the accessories pretty simple with a leather clutch from Bali and a bright pair of patent heels from Boden which pick up the bright blue in the print. An espadrille wedge, a simple pair of black heels or sandals would also work though and create a different look. This dress also comes in a grey matchstick print, a bright blue Turkish floral and a deep sea green if understated and classic is more your style. This is a roomy, drapey dress which is a generous fit – I’m wearing a size 10. I love that it skims without clinging, making it a great option for balmy nights. I love a high-low hemline too as I like a bit of extra coverage behind me, particularly when I’m bending over for the kids. The deep V at the back is a nice touch too. I’d wear this dress to drinks, lunch with the girls or even a family gathering. It’s a fun but flattering dress which is a great option if you have a busy social calendar in the lead up to Christmas. You can find Leonard St’s online shop here or visit them at one of their three stand alone stores in Melbourne (Fitzroy, Northcote and Flinders Lane, in the CBD). They’ve also just opened their first store in Adelaide. 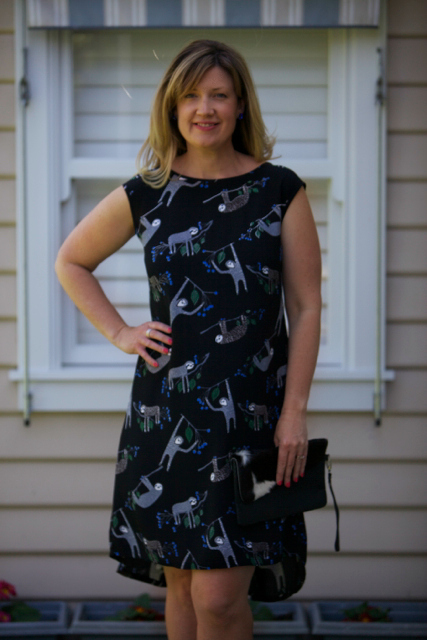 * A big thanks to Amanda McCarthy of Leonard St who gifted me the Planner Dress and loaned me the Zeusophobia dress for today’s post and Marnie from Materiel who gifted me the fabulous earrings to support my Frocktobering. For more info, check out my Disclosure policy here. 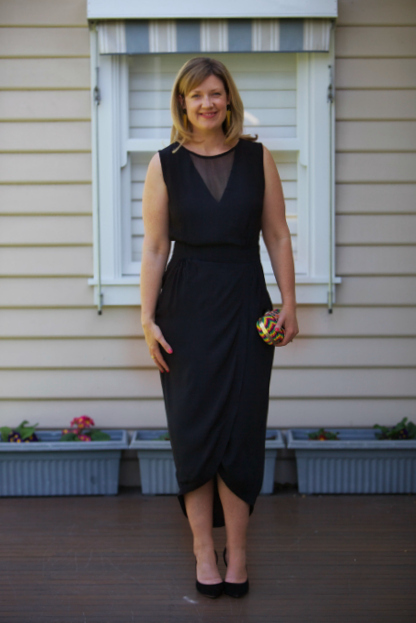 Remember, if you’d like to support me in my Frocktober-ing or find out more, just head here. Have you heard of or shopped at Leonard St before? What’s your pick of the above frocks and how would you style yours?